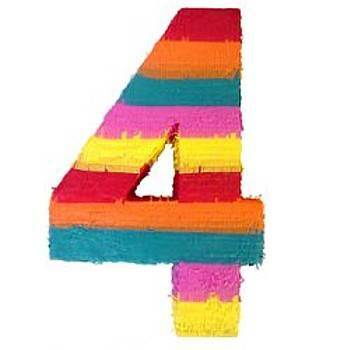 Today, my blog is 4 years old! Hard to believe that I have evolved into such a household name! (the heat must be getting to me). Here is my first post written on July 3, 2008 for your reading pleasure. The photo was taken with my old flip phone camera. (I've come a long way baby, I've graduated to a Canon point and shoot digital $100. camera). I would like to share some of my favorite products with you and host a giveaway for my favorite readers (and even the one's that are just ok) to celebrate going into my 5th year of blogging. 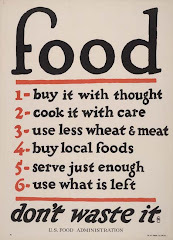 Most of these items are easily available in better supermarkets or online. They are some of my favorite little things to eat and use in cooking. 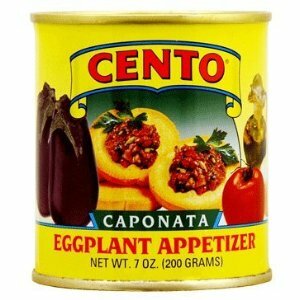 The first item is caponata (Sicilian eggplant appetizer) in the can. Progresso used to make this when I was kid, but discontinued it in 2004 for some reason. I found it again recently, made by Cento, and the world was right again. It's a bit oily, and you can only eat a little, but in an emergency, when I am craving eggplant, this does the trick. Spread it on toast, instant appetizer. Price about $2.79 per can. FUN FACT: (I used to have cans of caponata and jars of marinated artichokes in my locker in high school and eat them in the hallway. This is true. You think I was a little bit odd?). Anything from the Gracious Gourmet is amazing. 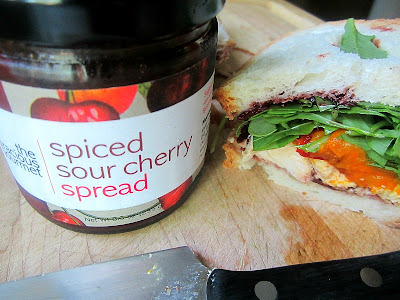 I am addicted to their hatch chili pesto, I put it in omelets, spoon it on avocados and in quesadillas, but their Spiced Sour Cherry Spread is to die for. I love it on a roast chicken sandwich with roasted peppers. You can order it online or find it at Whole Foods. 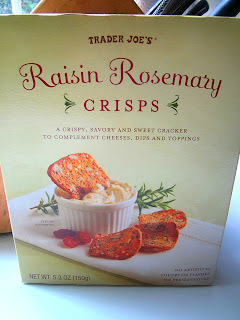 Next item I love, and it's easy to find, are the amazing Raisin Rosemary Crisps from Trader Joe's. I used to buy these at Whole Foods for big bucks $$$, but now they are easily affordable to buy in bulk at Trader's. Love. Next is my favorite tuna. 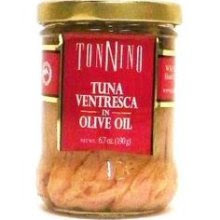 It is Tonnino brand, and I like the Ventresca style, which is the belly of the tuna, so it is very fatty and moist. No mayo is needed, in fact that would be a crime. Serve this with good olives on an antipasti platter. A little goes a long way. Price per jar about $6.99. 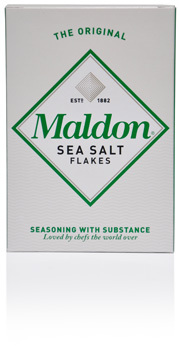 Another staple I couldn't live without is MALDON salt. It's not French, like I always thought it was, but British, and pronounced "Mal-din". I used to say it with a French accent all these years. Duh. After many taste tests (I swear, I have tasted every salt), this is my favorite finishing salt for everything. You pinch the flakes with your fingers and sprinkle on top of the dish (I use kosher salt to cook with, this salt is a finishing salt). And lastly, the thing I like the most is YOU. Readers and commenters that have made this humble little blog the most enjoyable part of my day. Thank you for reading my recipes and nonsense and for making this worthwhile writing another year. To thank you, I am giving 4 random readers a copy of Béatrice Peltre's beautiful new cookbook La Tartine Gourmande An Inspired Life. Just leave a comment telling us your favorite little kitchen product or ingredient. Winners will be announced on Saturday, July 7. Happy Anniversary, wishing you another great year! My new favorite ingrediants are the fresh herbs that I am growing in the garden this year. It makes such a huge difference to the taste of a dish. Fresh basil? Dried isn't even close to its flavor! I'm a relatively new reader of your blog and I've made several of your recipes - very yummy. The orzo spinach salad was great. I've made it twice, the second time was for a pot luck at work. Happy Anniversary Stacey, your blog is a happy part of my morning routine. My favorite staple at this time of year is Buitoni fresh Angel Hair pasta. I dress it with my homemade Pesto for a quick hardly had to cook meal. I've been reading your blog for about 4 years now and I have tried so many of your recipes and you ARE a household name in my house! We love your recipes and sense of humor! Thank you for starting my day off with a smile! Favorite little ingredient would be store bought pesto, I like to swipe it on sandwiches instead of mustard! Can't live without it! Wow! 4 years!! Happy Blogiversary!!! My favorite staple is fresh homemade pasta made with Semolina flour from Wegmans and my trusty 33 year old Osrow Pasta Maker!! well that and homegrown eggplant, but I need to wait a bit longer for that!! You've done a great job and have the fans to prove it. God bless and continued blogging for our edification and enjoyment. I really enjoy your blog and trying places you recommend when I visit my in-laws in Northern NJ. Thank you! I like espresso powder as a baking ingredient. It really adds something to chocolate desserts. Congratulations on your 4th blog anniversary Stacey. I think I've known you almost the entire time and have enjoyed every minute along the way. My favorite kitchen product is an old French pepper grinder that is a staple in all of the Hoffer households. Fortunately they are still made, but mine has lasted through almost 43 years of marriage, so I can vouch for their sturdiness. Actually we have probably 4 grinders, including the two in the condo. I also can't do without kosher salt, although I've grown fond of Maldon and French fleur de sel for finishing. Love the crunch they put on salad greens. Hi, love your blog Stacy. I am gluten free, so would love a chance to win Tartine Gourmande's new book! I love agave nectar, it is wonderful! Secret ingredient! Congratulations on 4 years and THANK YOU for providing me with reading entertainment and excellent recipes! My favorite kitchen product I couldn't do without is my kitchen aid stand mixer. I can't imagine baking without it. I think it's been just short of that since we met and have been working together. Your contributions to the Char-Broil newsletter and online community are exceptionally elegant. Thank you so very much for being fun to work with. On a personal note - your creativity inspires me and each day I open my email and find a note from you I am so very happy. Congratulations, Stacy and Happy 4th! I've loved your ideas and several of your recipes have become the one that Rocked for the Season - Apple Nougat Tart is still rocking around here! Indispensable in my kitchen these days is NOMU vanilla paste and wide coconut ribbons (or chips). This coconut make Alice Medrich's Coconut Macaroons absolutely addictive. my favorite thing in the kitchen...my pepper grinder...a gift from my son. it is heavy brass from greece...it is special...loved...pepper is my favorite seasoning! A bag of baby spinach -- so useful in everything from soups to stir fries. Or any greens from the Asian market like baby bok choy. Happy Birthday from another Joisey Girl!...and many more. Honey has to be my favorite, but Pernod is giving it a good race. I find that a little dash in a sauce just adds a sumpin' sumpin' that you can't put your finger on but know it's in there. My new favorite tool is: a julienne peeler / shredder. I've been using it on my zucchini and having squash "noodles" with various sauces, cold. It's fun, delicious, and healthy! Congrats on four years, wishing you many, many more! What a feat! Happy 4th birthday. I love your blog and it's always my go to place for food, funnies and warmth. Have a great holiday!!! Ms Stacey found your blog two years ago and read it regularly Happy 4th anniversary and Happy 4th July !!!!! Gosh, I've been reading & enjoying your blog since the early days. Congratulations on 4 wonderful & tasty years. As for Dave ingredients, I have a Kathy Casey finishing salt that I enjoy. A true workhorse and ingredient is Stonewall Kitchen's Maine Maple Champagne mustard. It sparkles on the tongue. My favorite implement is a wooden spoon. I have a crock full of spoons, including some that I inherited from my mother. I feel as though she is cooking w/ me when I use them. Congratulations on 4 years and many more. You are the go to for new recipes. My knives are the best. Without them I couldn't turn out your recipes. My favorite kitchen tool is my little Bialetti stovetop espresso maker! My best friend brought it back from Italy, and I use it every day, without fail. I'm on my patio drinking wonderful espresso over ice this very minute. Love! Hi Stacy, I discovered your blog about 2 years ago and a must read as soon as I log onto the computer for my morning routine if blog reads. I cannot survive in the kitchen without my wustof knives and , I have had them for years and are as good as new. I am obsessed with peppercorn mixes and my pepper grinder - nothing like freshly ground pepper , and have been using Maldon salt as a finishing salt for years.... of course Mortons kosher salt for everyday cooking . In your blog I love your tagged Ramblings and the adventures of your Vegetable Plot are hilarious. The recent rambling about what to bring for dinner just cracked me up because it is my pet peeve as well . 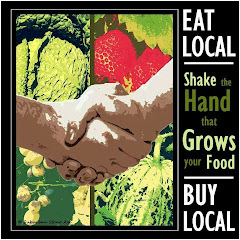 I am also a cookbook junkie but have not purchased anything for wuite a while , because like you I am busy with my vegetable plot , in my backyard - Chicago is having a hot summer and it needs my daily love and attention . Stacey! I was turned on to your blog about a year ago by Lynda S. and have LOVED it!! It is amazing at how much my pantry items have changed throughout the years. A lot of your recipes have that gourmet touch and what's so fun about that is I usually have the ingredients to whip up your recipes on the fly!! One of my favorite staples has been Quinoa! I have learned to use that in so many ways...replace it when a recipe calls for rice or pasta. I have even used it as my "oatmeal" for breakfast. It adds the extra protein and takes on the flavor of whatever you are making. my favorite ingredient would have to be ketchup...I know, I know, but it is the key ingredient in my 3 favorite recipes from my Daddy and they keep his memory alive for me. His chili, homemade sloppy joes, and homemade BBQ sauce were just the bomb! Every time I make one of these recipes I think of him! I really love Dalmatia Orange & Fig Spread. It tastes great on rosemary crackers with a little cheese. I'll bring this along on a camping trip and we feel like we're fine dining! Happy Anniversary, Stacey! My favorite grocery item would have to be Mancini Fried Peppers. They are the best in omelets, on sandwiches, and anything else you can think of. I grew up with these in our Italian kitchen and now my Texan husband can't get enough. And, of course, I wouldn't be able to live without my KitchenAid mini chopper. I look forward to this year and many more years of your amazing recipes! Thank you so much! Congrats and here's to many more. I have used Wiliam Sonoma pop up sponges for years... they wear like iron and last forever... just spray them with a bleach rpoduct or throw them in the dishwasher to clean. Stacey - Happy Blogiversary dear one. It's been a pleasure to wake up to your posts and to have gotten to know you and Henry in person. I adore the comments from MIL too. Keep up the good work. My fourth blogiversary is coming up next month. Do you think we'll still be doing this four years from now? My favorite kitchen gadget these days is a set of three nesting silicone measuring cups that my wife bought me last year made by iSi, I could not live without them. i love sesame oil! it's one of my favorite smells and flavors. i use a ton in the summer when all i want to eat is cold peanut noodles. Congratulations on 4 years blogging and sharing with us! I have never seen so amazing puff pastry concoctions! Love my Vitamix for soups and smoothies and use(cheater)Major chicken/beef/veg base a lot. Looking forward to your ongoing posts! My favorite kitchen ingredient is white truffle oil by Urbani. OMG. Just a wee bit and the most plebeian dish turns into food for the gods. I've tried other brands and this outshines them all. I have to say it again...OMG. Congratulations on your Fourth Anniversary! Been following for quite a while and really enjoy your writing and recipes. Here's to another four wonderful years! P.S. My favorite kitchen companion is my little crumb vacuum, Blue, a Welsh Pembroke Corgi! 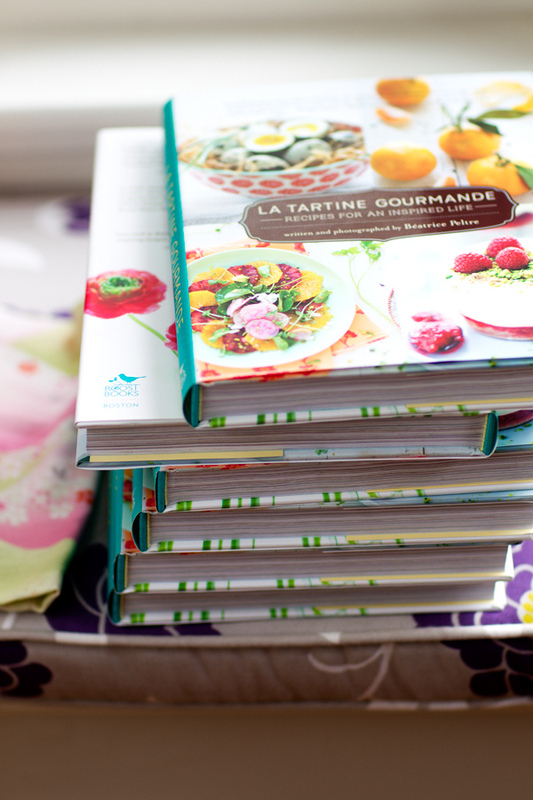 I already have the cookbook so don't enter me in the giveaway but...happy bloggiversary!! I've been following this blog since 2008! Anyways, my current favorite kiteche product is greek yogurt... I manage to put it into oh-so-many things. Happy blog anniversary! Thanks for the giveaway chance. I like the rosemary raisin crisps too. I love my vanilla bean paste and my large bottles of balsamic vinegar. Use it in everything. Happy Anniversary! 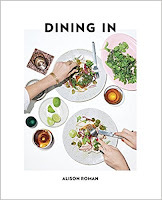 Thank you for introducing my family to many wonderful restaurants and inspiring delicious meals with recipes and cookbooks you have recommended. My favorite ingredient this time of year is the fresh mint from my garden----it adds an unexpected brightness to everything it combines with (fruit, pasta, pesto and relish, cocktails, etc). My kids are even requesting(and making for a snack!!) mint vegetables/pea puree with mint and lemon! Congratulations again! Happy Blogiversary dear Stacey! My mornings are like this, wake up, get my coffee, turn on the computer and go and check out your blog. You are the best, don't change a thing, I love your blog, your food and all your honest ramblings, your travels to Paris and all the cute pictures of you and Henry. You're creative and inspiring Stacey Snacks and I'm so glad I got to know you. Here's to another 4 years!! Congrats on 4 great years...am having my coffee reading your blog as I do every morning. My favorite ingredient is Organic Better than Bouillon Chicken Broth. It's great to have when you need a small amount of broth or just want to add some flavor to any dish...I use it for sauteed veggies, grains, soups etc. Congratulations! I'm glad that you decided to blog and still do! I've loved your blog in these past few months as I stumbled upon it. My favorite ingredient is rosemary! It just goes great in everything! After trying many veggie peelers, I found that the Kuhn Rikon peeler is the best. It's ~$4. Thanks for the many great recipes. Best product ... handy to have are the Better than Bouillon broth products. Easy to use in a pinch!! I haven't been with you the whole ride, but once I found you, I stuck. I've tried many of the recipes you share and I've never been disappointed. And your blog is a delight to read. Stick around. My favorite little appliance is my immersion blender: makes soups and salad dressings so much easier. And my favorite food product is Lyttos tapenade. I know I can make tapenade but I'm the only one who'll eat it. It's not fair being around so many olive haters. I love the demi-glace from Williams Sonoma. It really adds great flavor to soups, sauces, etc. Happy Anniversary and 4th of July...I've been reading your blog for a couple of years and really enjoy it! Can't wait to see what you cook and write about over the coming years. My favorite ingredient is Nutella. It's great in baked goods, as a crepe filling and I make an easy and delicious ice box cake with it using only 3 other ingredients!!! Happy Blogiversary! Congrats on 4 years and wishing you many, many more! I enjoy reading your blog. My favorite ingredient that I love using right now is the fresh basil that I'm growing. I'll have to try those Raisin Rosemary Crisps, they look good. The kitchen tool I love the most is my Kitchen Aid stand mixer. The ingredient I love the most is fresh basil that I grow. Happy 4th and 4th Anniversary. I don't comment often but make so many of your recipes and use your blog as I do a cookbook! 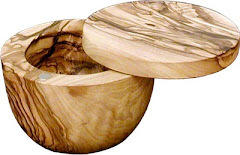 I like one of your other readers, love my wooden spoons and still have my grandmother's spoon and just love it. My second favorite is my kitchen aid! Two things I would not be without. Thank you again Stacey for your excellent blog -- you are amazing. Happy Anniversary! Your blog was one of the first ones I started reading. Thanks for all the inspiration and delicious recipes, Stacey! Happy 4th of July! Spanish smoked paprika! It imparts a delicious, subtle smokey flavor into red sauces, egg salad/chicken salad, rich dishes, you name it. Yum! And garlic, love my allium. 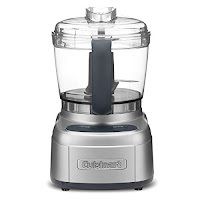 Best kitchen gadget = Cuisinart food processor + Cuisinart immersion blender. Love your blog! Happy 4th Stacey. We were just talking about you and your blog last night at a Fourth Eve party! Love reading all the comments of peoples' fav things. My staple is TJs canned artichokes and tool is a Kyocera mandolin. Thanks for your commitment, you've enhanced our lives! Dennee Los Angeles. I'm SO glad we met through your blog, Stacey. Happy Anniversary indeed. Can I casually pitch out that I miss your daily entries, but I completely understand why you've trimmed back? The "daily"ness of it was so wonderful. Favorite ingredient? Why, Herbes de Provence, of course. Tee hee. I just wanted to stop by and say that I always read your blog. Maybe I don't comment each time (usually n a hurry) but I never fail to be inspired by the way you cook. I'm in awe that you blog as often as you do. I will NEVER spell raspberry wrong again! Looking forward to more of your recipes. I love my own homegrown basil on my deck. Summer cooking can't be beat! I hope you have many more years of blogging! Thank you for the daily recipes, shares and advice I have been quietly reading your blog for over two years and I always enjoy it. My favorite kitchen item is a secret ingredient for many of my recipes (and is always on hand) - basil pesto. I am so grateful that you started your blog, and that we became friends!! Your encouraging words helped me to keep on baking, and turned a hobby into a business! My fab ingredients are simple- buttermilk: it keeps everything from poultry to cakes moist. Lemon: adds a summer flair and can brighten up any leftovers. Fresh cracked pepper: it's my go to seasoning when I'm counting calories! Fig preserves! My newest favorite...I use it on everything/anything. Happy Anniversary! 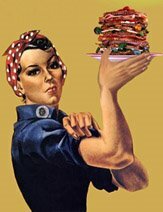 Keep up the great work - I check in daily and try many of your recipes. Happy Anniversary Stacey! Love your site - have cooked many things from it. I must say if I didn't have my heavy duty chef's knife, I couldn't work in my kitchen! Keep up the great work and thanks! Happy Anniversary to your site! Since I work from home it is a wonderful distraction to my day. My favorite ingredient is Old Bay seasoning (being a native Marylander). Happy Anniversary. I really enjoy reading your blog. My current fave (and it changes frequently) is Amish Tomato Jam from the Amish Buggy. 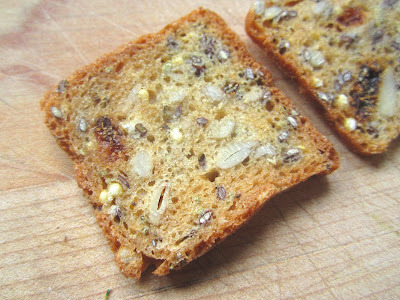 I spread it on ;whole wheat toast for breakfast or with butter on warm bread just out of my bread machine. My new favorite seasoning for summer grilling is Borsari "The World's Best Seasoned Salt". You can get it at Whole Foods in the Meat & Seafood Dept....I have been sprinkling it on everything: meat, seafood, poultry, veggies...and it enhances what ever it is you are grilling perfectly! Happy Anniversary....led to your blog by Suzette at Cripes Suzette and now visit you every day. Trader Joe's has some great products. Standbys for when I cannot cook (and there are only two of us) are their Rustico Pasta Sauce and Flame-broiled (frozen) Meatballs. Sounds like heresy on a food blog, but sometimes even the best cooks are pushed to the wall! Their bottled marinated artichoke hearts are excellent, as are their frozen ones. For regular tuna for sandwiches, where Best Foods (Hellmans) mayonnaise is used in our house, Costco's Kirkland brand albacore wins hands down - real solid pack without a lot of excess air space in the can and/or flakes, a 7 oz can, and an excellent price. For everyday coffee their Jose's Colombian beans in a 3# bag are excellent - I grind them at home to order. A from scratch cook for decades, I now have to deal with other issues so time is at a premium. I haven't completely given up, but do appreciate a few time savers along the way if the quality is good. Happy Anniversary, Stacey! Your blog e-mail is the first one I open every morning. "What wonderful surprise food discoveries and irreverant musings await?!" Yes, you're a staple in our home: "Stacey said..." Love grilled veggies, garlic tomato and basil. And can't live without Hellman's mayo! Here's to another 4! Hugs and thanks! Congrats on 4 years, love your blog and follow it when I am not running like crazy with lots to do..love tj artichoke spread and lemon frozen desserts, we are not getting some heat those lemon dessert thingie in real lemons hits the spots..love their spices and always their pastas and of course fig jam but only get it at a new store here new seasons..yummmm keep up the wonderful blog, from mjs at momanddad00@clear.net! Congratulations on four fabulous years! It's been a pleasure to follow along since the beginning. Thank you for the tip on the Trader Joes crisps! This will save me a TON of money! Congrats on 4 years. Congrats and Happy Belated 4th Anniversary Stace!